More technology, more lead gen, more confusion, less time to manage it all; these are the issues facing marketing without a marketing operations manager. But wait, they told us that the technology is simple and easy to use, no one said we’d have hire a new high paid marketing ops person to run it all. 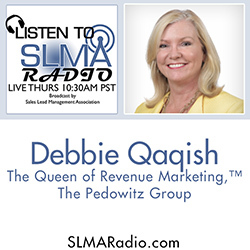 In this interview with author Debbie Qaqish we discuss the critical nature of the marketing operations function and why the right manager increases marketing and sales efficiency. Debbie dispels the mystery surrounding this new position. The host is Jim Obermayer.